The sky was deep blue and crystal clear. The air was crisp and cool with a hint of woodsmoke from early morning fires. I was filled with a sense of peace, as I drove west on 441 through Mount Dora and Eustis. Cassi, my 3 year old granddaughter, and I were on our way to the Downtown Eustis park, one of our favorite Friday play places. I’ve been mulling this conversation over and over in my head trying to determine why Cassi connected loving Jesus with loving Santa Claus. What conversation had she overheard that made this connection for her? Were they of equal importance in her little mind? Had we been talking so much about “Santa’s coming to town” that she now understood Jesus and Santa to be on the same level of significance? Had I demoted God to the level of Santa Claus? She’s only 3 and her understanding of Jesus comes from what she has heard those older than her share. She doesn’t understand the Trinity, but then few of us do. She knows that Jesus loves us and that we talk (pray) to him about our needs and concerns. She doesn’t yet understand John 3:16, but she does understand that when things aren’t going right we go to Jesus (God) and talk to him about it. She understands that we thank Jesus for the blessings in our life. All this is good, but is it enough if she understands Jesus and Santa to be worthy of the same kind of love. I want my granddaughters to understand that Jesus is the truth, the life and the way. That apart from him NOTHING ELSE matters. I want them to love him because he is God, not for what he has done, or what he will do. So now I ask myself what can I do to help them, and in this case, Cassi, understand His Majesty? My Cassi is now 4 years old but this is still my mission…………..
very nice story. I would like for everyone to know that there is no greater love than that of our Jesus, and that our love for him should be just as great….I understand your mission. 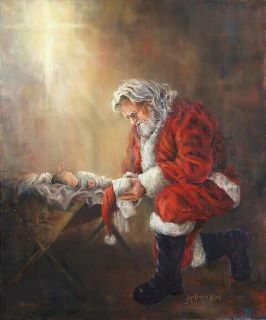 I think that if we keep our Faith and Love for Him so strong that our children and grandchildren grow up with it when they are at the right age they too, will understand that santa is fantastic but Jesus is Wonderful…..